Bungie has done a great job of making fans salivate over Halo: Reach by keeping most the aspects of the game under wraps. Thus far, all the info we have been able to discern has come from the trailers which Bungie released–until now. 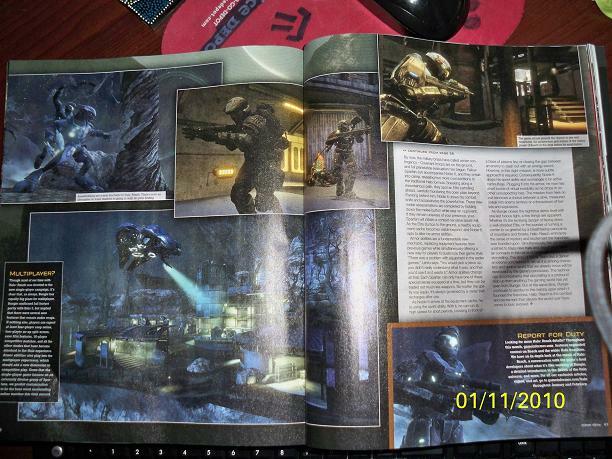 Yesterday, leaked pictures (shown below) of an upcoming Game Informer magazine hit the web, and the information is quite revealing. It looks like the team at Bungie is going all out on this title. 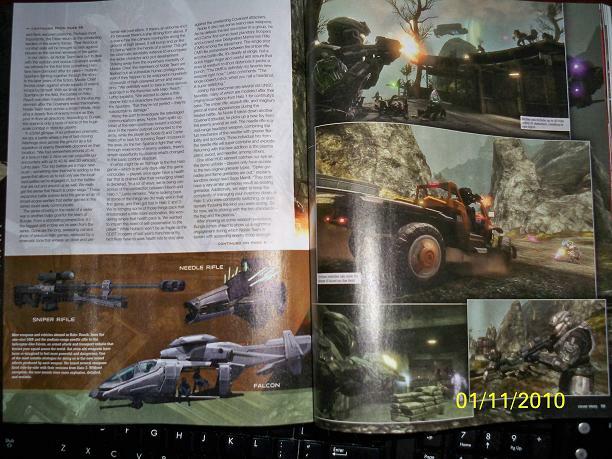 The magazine deals mostly with the campaign–profiling new weapons, characters, and vehicles–but tidbits regarding the multiplayer experience were included as well. All the info we have gathered is after the jump. 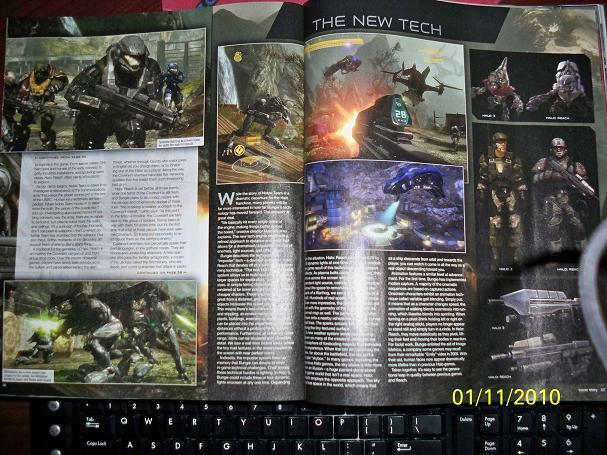 Rumors were floating around that the game would follow the book Fall of Reach, but this is not the case. The game will instead follow the Spartan soldiers, codenamed Noble Team, as they traverse the world of Reach before it is destroyed (the happenings on Reach occurred before anything in Halo 1). Given that the levels will show Reach being destroyed in a progressing manner, we infer that the game will take place over a considerable amount of time, instead of just a few days. The game is also purported to be darker than the previous Halo games. We will also be able to alter the appearance of the main protagonist, Lone Wolf, a feature new to the Halo series. The biggest difference in gameplay is Bungie’s use of an overhauled graphics engine. As we saw in the in-game trailer, Reach will show a massive improvement over the graphics in Halo 3 and ODST. Reach has outsourced facial animations to Image Metrics, who have worked on titles such as Assassin’s Creed 2 and Gears of War 2. Besides better graphics, Reach will increase the scale of combat. Previously, only 20 AI characters could be on the screen at a time, but with the new engine, over 40 AI and 20 vehicles can be present! Cut-scenes have been improved as well, and are going to be more cinematic. The HUD is now yellow instead of blue, and the health bar has made its return, alongside the energy shield we have grown accustomed to. The motion tracker is now oval-shaped instead of the customary Halo circle. Assassinations are different as well. Instead of simply coming behind an enemy and meleeing, one must hold down the melee button; resulting in a satisfying knife slash. 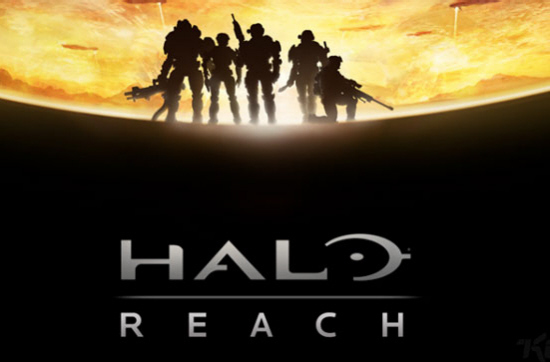 Reach is said to incorporate full stealth gameplay. You are now able to sprint via the use of equipment permutations (there are other permutations, we just don’t know what they are yet) available at certain points in the levels. Co-operative campaigns, splitscreening, theater, and Forge all make a triumphant return in Reach. Reach introduces a slew of brand new characters, starting with the Noble Team, comprised of 5 Spartan III’s, and 1 Spartan II. 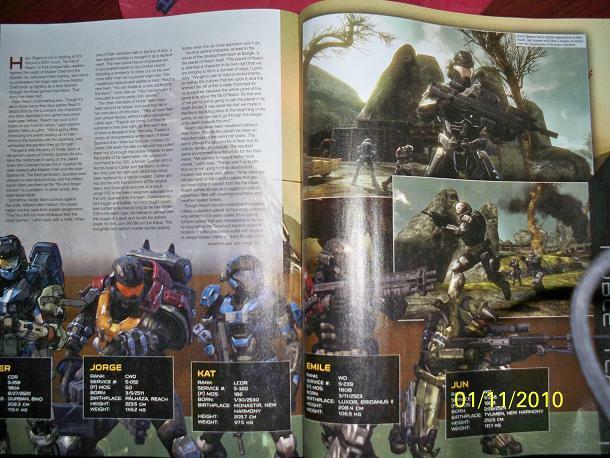 Carter 259, Kat 320, Emile 239 (He has the skull helmet in the trailer), Jun 266 (the sniper), and Lone Wolf are the Spartan III’s (with Carter and Kat being the only original members of NT), and Jorge is a Spartan II heavy weapons specialist, and thus larger than the rest of the team. Marines similar to those in Halo 1 will be in this game, and it is possible that Human Insurrectionists will make an appearance. The covenant are back, and deadlier than ever. The grunts look considerably more threatening but will most likely continue to be pushovers. Elites make a return in Reach as well: they seem taller and are no longer hunched over. If Reach multiplayer allows for both Spartans and Elites, then this is a significant improvement as Elites won’t have the same hitbox issues that we’ve seen in previous versions of Halo. Jackals seem to have been replaced with “Skirmishers,” an enemy who attacks in packs and flank secure positions. They should prove to be annoying at the very least. An unfortunate change, especially for those who play with the IWHBYD skull on, is that Covenant soldiers speak in their own languages, instead of English. There are a few exciting changes and additions to the weapon repertoire available in Reach. The sniper, assault rifle, and magnum will be returning, but it seems the battle-rifle will be replaced with a single shot rifle dubbed the “Designated Marksman Rifle.” It’s possible they removed the BR due to its inaccurate spread, but we can’t be certain. The needler also gets an overhaul, and has been morphed into a mid-range headshot capable weapon. Due to inconsistencies in the game physics of spike and flame grenades, both have been removed. This leaves only frag and plasma grenades. I’ve always thought that if there are vehicles in a game, you should be able to drive them, no matter what. It seems Bungie felt the same way. We will be able to drive civilian vehicles, alongside the more common warthog. A new helicopter transport, the Falcon, has also been introduced. Covenent Spirits (the dropships in Halo:CE) return alongside the more powerful Phantoms, which now have a search light. Halo: Reach is looking to once again disrupt the first person shooter genre. The graphical overhaul is much needed, and thus far is impressive. Halo has always had a compelling storyline and the introduction of new characters, enemies, and most importantly a new world, are sure to keep players enthralled. This little sneak peak sure leaves me wanting more, and I cannot wait until the Beta is available to the public.